Dehradun, June 8: There are only 14 days remaining for International Yoga Day and this year Uttarakhand’s capital has been selected as the host the main event of 4th International Yoga Day celebrations (IDY-2018). Yoga guru Swami Ramdev and Uttarakhand Chief Minister Trivendra Singh Rawat on Thursday took part in a curtain raiser event in Dehradun. 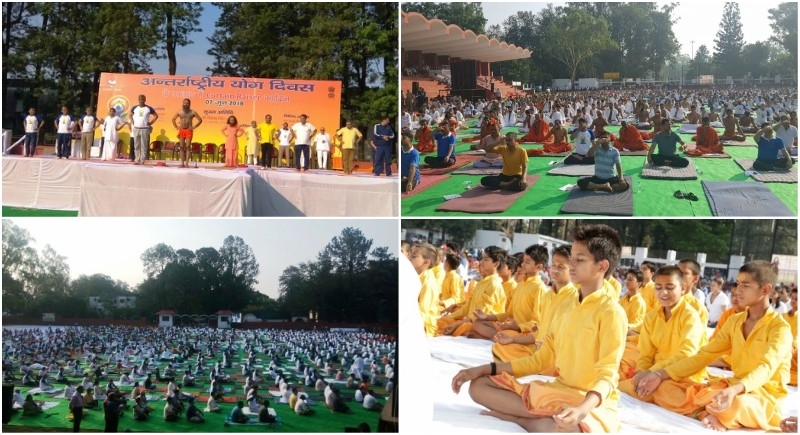 Along with Swami Ramdev and the Chief Minister, AYUSH MoS Shripad Yesso Naik, Swami Chidanand Saraswati also rehearsed for the International Yoga Day, which will be celebrated all across the globe on June 21. Prime Minister Narendra Modi is also expected to take part in the main event. “When the political power, the power of sants and that of spiritualism merge...it paves the way for the welfare of the people,” he added. Last year the host for IDY was Lucknow, capital of Uttar Pradesh where nearly 51,000 people demonstrated Yoga protocol along with dignitaries.